The Leinster man held off stiff competition from Jonny Sexton to land the role of captaining Ireland against the Springboks. 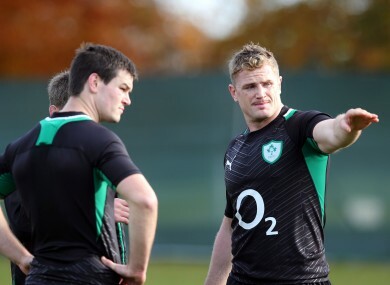 JJamie Heaslip (right) gives directions to Jonny Sexton. IN THE END the call was even closer than the American Presidential election [if you look at the popular vote and don't mention Ohio]. Jamie Heaslip and Jonny Sexton took their turns talking to the media out the back of Carton House this afternoon and stressed that team commitment, over personal glory, remains the goal for wounded Ireland. Declan Kidney named Heaslip as his captain for Saturday’s game against South Africa with a longer-term appointment looking likely if Ireland can topple the ‘Boks and Argentina. While the Number 8 was off getting publicity shots on a sun lounger, Sexton fielded questions about whether he had been involved in the captaincy discussion. Sexton told TheScore.ie, “It is never something I would come out, publicly, and say – that I’d like to be captain. It is more of a thing where Declan will come to you and offer it to you if he thinks you’re the right man and then it is up to you whether you accept or not. I spoke to Declan, briefly, about it last week. He came to me and we had a chat about it. For him to come and talk to me about it was an honour. “I can imagine how Jamie is feeling. It’s a very proud moment for him and he deserves it. He’s an outstanding professional. He has captained Leinster really well and deserves his chance. I think Paulie [O'Connell] would have been captain if he was fit. It’s a pity he’s not playing. I’m sure Jamie will do a good job. As for the new Ireland captain, he spoke of his honour at getting the job and how he mulled over celebrating out loud when he got the news – shopping for a an engagement card in Tesco. Heaslip told TheScore.ie, “You ask anybody who plays rugby and they want to lead their team out onto the pitch. To lead your country out is pretty awesome. It’s Roy of the Rovers type stuff. I’m getting flashbacks to when I was eight; throwing the ball around the house, thinking I was Simon Geoghegan. It’s a dream for a lot of players. “With the group of players we have, we’ve got leaders in there,” he added. Kidney was also on the scene, going through his decisions and observing his players as they talked up the challenge of South Africa and extolled on the best two weeks of training they have ever been involved in. The coach’s most prescient comment of the afternoon came at the team announcement when he was asked about his choice of Heaslip. “Jamie is – even though he’d deny it – he’s a consummate professional from the minute he shows up for work,” said Kidney. Heaslip will need his 22 teammates to stand up and stand behind him as they face into one hell of a challenge on Saturday. Email “New direction: Faith shown in Heaslip as the man to lead Ireland forward”. Feedback on “New direction: Faith shown in Heaslip as the man to lead Ireland forward”.